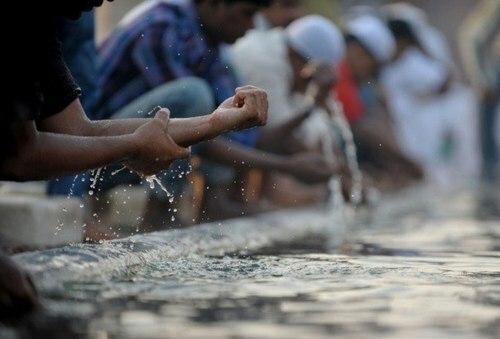 Home Hadith Posts Hadith: Why you shouldnt rush Wudu? Hadith: Why you shouldnt rush Wudu? The Prophet (Sallallähu alaihi wa sallam) said, “None of you who uses water for ablution and rinses his mouth, snuffs up water and blows it, but the sins of his face, and his mouth and his nostrils fall out. When he washes his face, as Allah has commanded him, the sins of his face fall out from the end of his beard with water. Then (when) he washes his forearms up to the elbows, the sins of his arms fall out along with water from his finger-tips. And when he wipes his head, the sins of his head fall out from the points of his hair along with water. And (when) he washes his feet up to the ankles, the sins of his feet fall out from his toes along with water.